U.S. President George Bush didn't visit Canada until the very final months of his first term in office in 2004. It took a while for U.S. President George W. Bush to make his first official visit to Canada. So long, in fact, he'd already been re-elected for a second term as president — and long enough for Canada to have seen an election of its own and also a change in the prime minister. 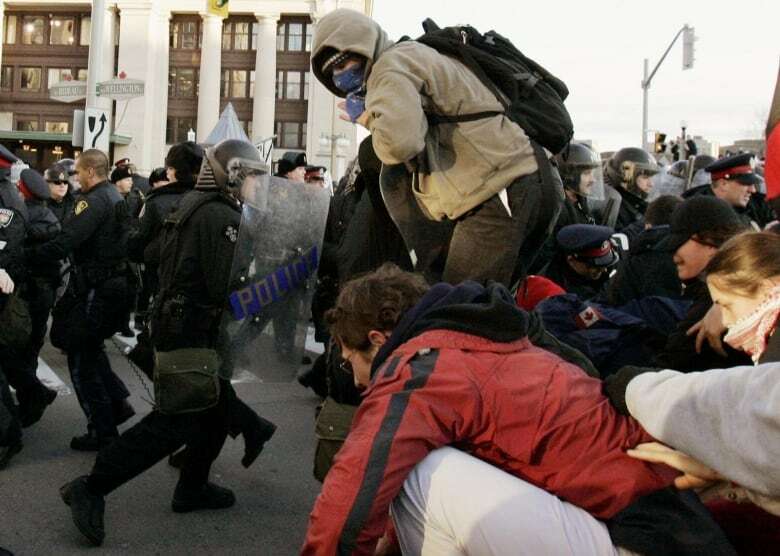 The U.S. leader landed in Ottawa on Nov. 30, 2004, as part of a packed, 26-hour visit that included talks with Prime Minister Paul Martin, as well as stops in the capital, across the river in Gatineau, Que., and also in Halifax. The long-delayed official visit — Bush had actually already been to Canada twice to attend Summits of the Americas and G8 conferences — came at a time when the relations between the U.S. and Canada were publicly perceived to have worsened. But Bush downplayed any divide between the two countries when speaking to the media. "I frankly felt, like, the reception we received on the way in from the airport was very warm and hospitable," Bush told a news conference on his first day of the visit. "And I want to thank the Canadian people who came out to wave — with all five fingers — for their hospitality." The 9/11 attacks had occurred during Bush's first term in office, after which the U.S. had tightened security along its borders and launched a military effort in Afghanistan that Canada joined. The U.S. also led an invasion of Iraq during Bush's first term in office, an action the Canadian government hadn't supported or participated in. The conflict would eventually claim more than 100,000 lives in that country. While in Canada, Bush defended his country's actions in Iraq. "I'm the kind of fella who does what I think is right and will continue to do what I think is right," said Bush. "I'll consult with our friends and neighbours, but if I think it's right to remove Saddam Hussein for the security of the United States, that's the course of action I'll take." 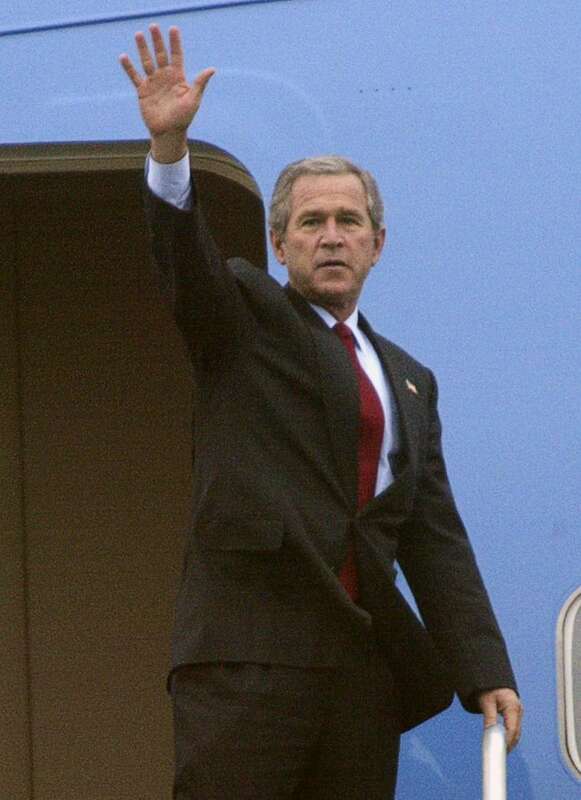 On the final day of the visit, Bush made a stop in Halifax, where he offered thanks to the Canadians who offered shelter to thousands of Americans who had been stranded while travelling abroad on Sept. 11, 2001. "For days after September the 11th, Canadians came to the aid of men and women and children who were worried and confused and had nowhere to sleep," Bush said. "So, let me say directly to the Canadian people and to all of you here today who welcomed Americans: Thank you for your kindness to America in an hour of need." The U.S. president then waded into a controversial topic, expressing hope that the two countries would "move forward on ballistic missile defence co-operation to protect the next generation of Canadians and Americans from the threats we know will arise." Responding to Bush's comments — which the Canadian government had not been expecting to hear the U.S. president say publicly, according to CBC News — Martin indicated Canada would make its own decision on the matter. "We are a sovereign nation and we will make the decisions about our airspace," said Martin, after Bush had made his remarks. The trip north would be the U.S. president's last visit to Canada during Martin's truncated tenure as prime minister. Bush would return to Canada in 2007, for talks with Prime Minister Stephen Harper and Mexican President Felipe Calderón. And it was Bush who was in office when Harper made his own first official visit to Washington, after he became prime minister.